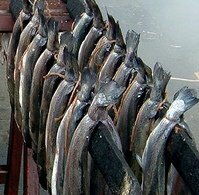 Arbroath smokies originate in Auchmithie, a small fisihing village 3 miles north of Arbroath – a town on the East coast of Scotland just north of Dundee. Arbroath Smokies are traditionally tied in pairs and hung over a triangular "kiln stick"
It's not the only thing that Arbroath is famous for, there's also the Declaration of Arbroath. Drawn up on April 6th 1320 and signed by 38 Scots lords it was a plea to the Pope to take Scottish independence from England seriously and the Pope duly accepted. I bet the Scottish National Party wish that it was as simple as that these days! Here endeth the History lesson and now back to the Smokies and what makes an Arbroath Smokie? The fish isn't anything special, you can use either haddock or whiting (although most would argue that haddock is traditional), what is special however is the way that the fish is prepared and the smoking process. Arbroath Smokies and Finnan Haddock (also known as Finnan Haddie) both originate from the East coast of Scotland and both start off with freshly caught haddock. The fundamental difference is that the Arbroath Smokie is hot smoked (cooked) and ready to eat whereas Finnan Haddie is cold smoked and therefore needs cooking before eating. The fish is gutted and the head removed but the belly and tail remains intact so the raw Smokie looks like any other gutted fish. The raw Smokies are then paired up and tied at the tail using hemp twine, this is so the fish can then be hung on the kiln stick (a triangular rod on which the fish are smoked) so that one fish hangs on one side of the rod and the other fish in the air hangs on the other side. Traditionally the smoking was done over a hard wood smoke in barrels that had been sunk into the ground. The lid was placed on the barrels and then any parts of the barrel that was exposed would be covered in wet jute sacks to maintain a humid atmosphere. The final product has a dark tarry appearance but this is really impossible to replicate without making the inside of your smoker dark and tarry too so having a dedicated smoke cabinet for hanging fish is definitely an advantage. I built my own cabinet specifically for fish and it works a treat. 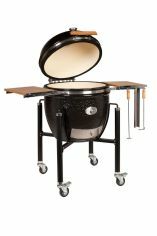 If you wish to do the same then I've written up easy to follow homemade BBQ smoker plans which you can buy for a $9.95. All you need are some basic woodworking skills and you could be up and running in a couple of weeks. Assuming that you have gutted your haddock and removed the head then it's a three stage process. Haddock is a lean fish so the brining need not take that long (compared with mackerel for example), just 30- 40 minutes in a 80% brine is enough for thorough salt penetration. Click here to learn more about brining and use my Brine Solution Concentrations to learn how to make a brine of a certain concentration. After brining the fish should be hung to dry for 2-4 hours. I do this in the smoker cabinet so in essence the fish is hung on the rods in preparation for smoking but I don't apply any heat just yet. I also leave the door to the cabinet slightly ajar to allow air to flow. Cool smoke (86°F or 30°C) for 30 minutes – I do this with an electric element in my home made smoker. Warm smoke (160°F or 71°C) for a further hour – to maintain this temperature I use the frying pan over the gas burner. It's this third stage that produces the really dense smoke and the deep color and at the end of the hour your Smokies are ready. Eat them warm or cold. Note: in 2004 the Arbroath Smokie achieve protected status under the European Union's Protected Geographical Indication (PGI) scheme which is designed to protect food names. As such, you can only commercially make and sell Arbroath Smokies within a 5 mile (8 kilometre) radius of Arbroath, so you can make your own homemade Arbroath Smokies for your own consumption by using my guide but don't sell them!